I personally believe that Math is the Universal language and I am certainly not the first person to either coin that phrase or hold that belief. And it was with that thought in mind that I went into reading Lionel and Patricia Fanthorpe's insightful new book on the controversial subject of numerology. For those that are not overly familiar with the term, numerology as defined is any study of the divine, mystical or other special relationship between a number and some coinciding observed (or perceived) events. It is most frequently associated with occult beliefs and occult practices. I had the pleasure of reading some of the authors books in the past so was already familiar with them and their style of writing when I received my copy of this book. 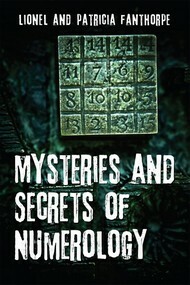 Lionel and Patrica are a prolific team of paranormal investigators, researchers and writers, and they do not disappoint with this latest offering on numerology. This is not just another new-agey quick copy/paste book that seem to be popping up all over the net and Amazon.com these days. This is a very well researched and in-depth look at the importance of mathematics and the practice of numerology throughout history and different cultures. The book is over 350 pages in length with many companion photographs and illustrations. And really could be a stand alone edition for those who have a passing interest in the subject and are not looking to become numerologists themselves. In my opinion this book is not a light bedtime read as are some of the authors previous compilations on ghosts, and haunted locations, however it is suitable for both the scholar and those that might just have a mild curiosity towards the subject. After enjoying this work I can honestly say I do not believe the mystery of numerology has been resolved at this point, but have a much greater understanding of the richness and roles numbers can and do play in our lives. Lionel and Patricia Fanthorpe are president and first lady of the Association for the Scientific Study of Anomalous Phenomena. They have over half a century's experience investigating and writing about the paranormal, with more than 30 successful titles. They live in Cardiff, Wales.